Remarkably there are at least two photographs taken during D-Day by the men of 21 BDS and the story of how these photographs came to survive and the origins of why there was a camera available at all, is noteworthy. We have already discussed that at the last minute a number of specialists were added to the team. These men had not the benefit of the in depth training that had been afforded to the majority of the GCI and MSU units that made up the first echelon but were deemed to be necessary additions. Four of these men came from 60 Group Headquarters. 60 Group were the RAF Radar Section specialist unit dealing with training and research and development into new and more powerful and accurate radar systems. The Headquarters was at Leighton Buzzard and due to their specialist knowledge not only in terms of existing equipment but also with the latest improvements that had been created within 60 Group, there were asked to provide four personnel to join 21 BDS at the last minute. The four men who came from 60 Group were Squadron Leader Best, Flight Lieutenant Hitchcock, and two other men whose ranks are unknown but their names were Burns and Willmott. It would appear that when 60 Group was asked to provide the specialist knowledge, a Leica camera which belonged to 60 Group was provided to Flight Lieutenant Hitchcock to record their involvement with the D-Day landings. Hitchcock was allocated to go ashore with Flight Sergeant Muir Adair and reference to their stories can be read in the section called Men and their experiences. Suffice it to say that neither of their landings went according to plan and their vehicle was drowned when it came ashore when it disembarked from their landing craft. When their lorry first came ashore and stalled due to the depth of the water Flight Lieutenant Hitchcock gave the camera to Muir Adair for safekeeping whilst he waded ashore to seek the assistance of a breakdown truck which he had seen on dry land. However by the time he had reached the beach and began to pull the tow chain out to his lorry, the tide had come in sufficiently fast that gave Muir Adair no option, other than to try and swim for his life. Much to his credit he attempted to protect the camera and stuffed it inside his tunic for safekeeping. The tide was coming in fast by this stage and the currents took Muir over 600 yards to the east of their abandoned lorry where he made a desperate landfall just before his strength gave up, at a position not far from the St Laurent draw. His experiences from when he landed are graphically told within the section Men and their experiences but remarkably through this testing time where he and assorted US army survivors fought their way up the bluffs and eventually met up with his RAF colleagues again on D-Day plus 1. What is more remarkable is that he held on to 60 Group’s camera all this time and Ned was delighted when he met up with Muir Adair again, not only to see Muir alive but that the 60 Group was camera was intact, if somewhat soggy. Finally when Ned returned to 60 Group on 4th July 1944 and handed back the camera we know that at least two of the images he took had survived its watery experience and these images are shown below. 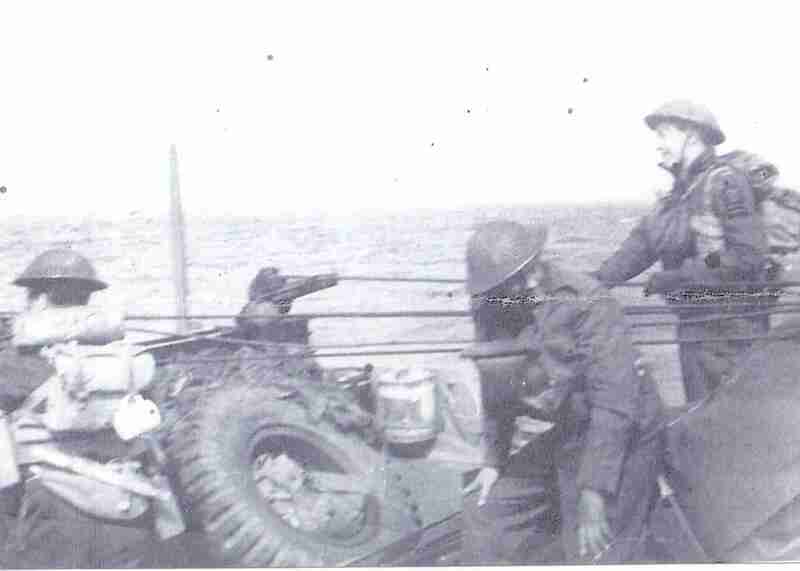 Three personnel of RAF GCI 15082, part of the 1st Echelon of 21 BDS prior to landing on Omaha Beach, 6th June 1944. Taken by Ft Lt Ned Hitchcock. Photograph courtesey of Flt Sgt Muir Adair. 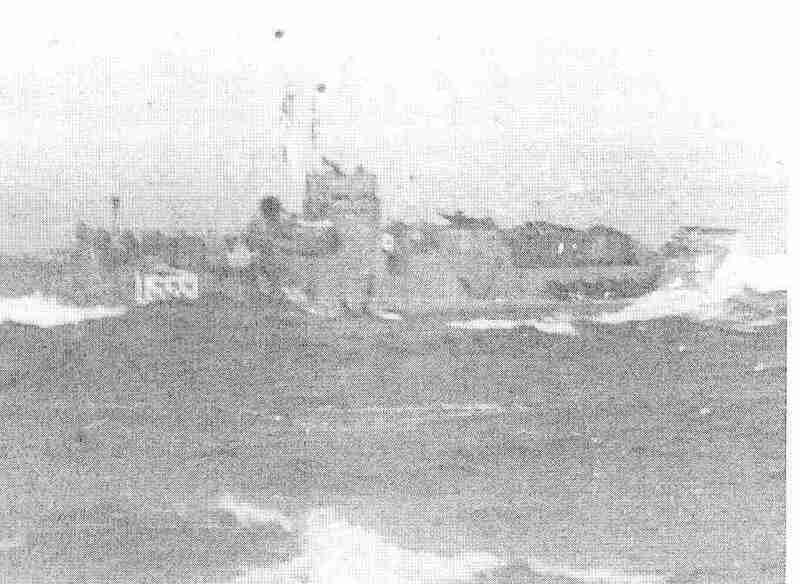 RAF GCI 15082 abourd US Navy Landing Craft Tank ( LST) 551 on the way to Omaha Beach, 6th June 1944. 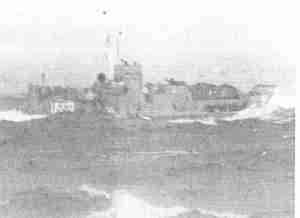 Photograph taken by Flt Lt Ned Hitchcock. Image courtesey of Flt Sgt Muir Adair.